Staying well hydrated is particularly important during the summer when it’s hot, hot, hot. But not everyone loves downing glass after glass of water. Sneak more water into your day with these easy tips. If you find plain water boring, add just a splash of 100 percent fruit juice like orange or apple. You can also freeze the juice into ice cube trays and add them to your water for a splash of flavor without adding too many calories or too much sugar. Did you know that fresh produce can consist of up to 90 percent water and can count toward your daily intake of H2O? Ditch heavy cold weather foods like stews for lighter fare like salads and juicy fruits like peaches, watermelon and berries. Tea has so many health benefits and can also add toward your daily tally of water. But premade teas can get pretty pricy. To save on this water alternative, invest in a good sun tea jar and make your own with a few of your favorite teabags (experiment with various flavors until you find one you love). Adding herbs like mint and slices of fruit while it soaks in the sun is another great way to add flavor without adding calories. If you’re used to sipping soda, the switch to water can be a bit drab. So try carbonated water (or soda water) instead in any flavor you like. 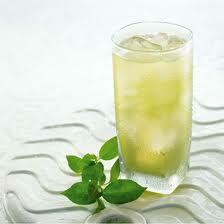 Do not confuse soda water with tonic water, however, which can be chock full of calories. Drinking your eight full glasses of water a day can seem laborious at first, but keep at it. Down a glass first thing in the morning, and try drinking a full glass before each meal (in addition to while you are eating). You will find that drinking more water has all kinds of benefits on your health. Curbing dehydration can ease headaches, help you sleep better and make you feel fuller without as much snacking (which can lead to nearly effortless weight loss! ).